So many golfers suffer from fat chip shots that I thought I would offer a (different) cure. Now the reason golfers suffer from fat chip shots, is because the club hits the ground before the ball. So where should the club hit the ground? 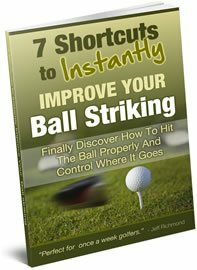 You see, the reason so many golfers hit the ball fat is because most golfers aim to hit the back of the ball. The problem with doing that is if your timing is out a bit then you will hit the ball fat. For chip shots the club needs to hit the ball when the club is slightly descending so the club will hit the ground after the spot where the ball is sitting. So knowing that, here’s a really simple cure for fat chip shots. 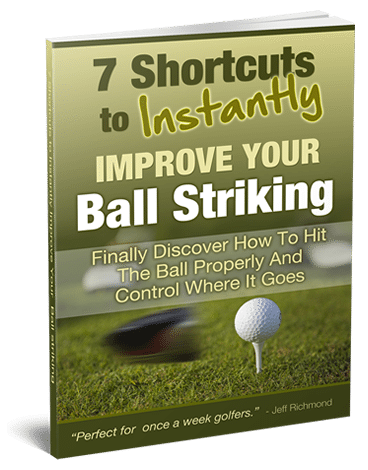 Instead of focusing on hitting the back of the ball when you’re chipping, move your focus into the front of the ball. So it’s almost like you’re trying to hit the front of the ball. This will take some getting used to, but it will help you a lot if you consistently fat your chip shots. Give it a try and let me know how it helps you.